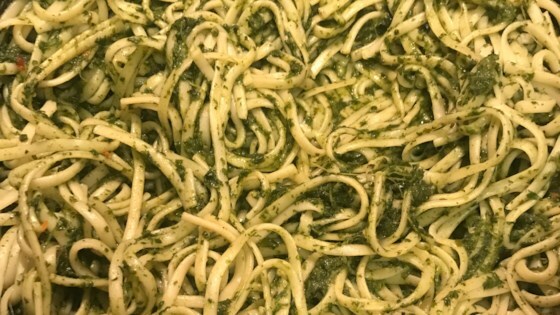 "This is a pesto recipe I invented last spring. Goes well with a glass of Chardonnay. Non-vegans can add some grated Parmigiano-Reggiano or grana on your pasta!" Bring a large pot of lightly salted water to a boil; cook the linguine at a boil until tender yet firm to the bite, about 11 minutes; drain. Place frozen spinach in a microwave-safe bowl; defrost in microwave on medium for 2 to 3 minutes. Squeeze as much water from spinach as possible. Blend spinach, parsley, 1 tablespoon olive oil, and garlic in a blender until smooth. Heat about 2 tablespoons olive oil in a skillet over medium heat; add lemon zest and pesto. Season with salt and black pepper. Add linguine and toss to coat with pesto; cook until warmed, 2 to 3 minutes. Pesto is to die for.